Clea Simon's latest book, Shades of Grey, featuring doctoral student Dulcie Schwartz who specializes in gothic literature, is now on the shelves in bookstores. With a hint of romance, a ghostly cat, an intricate mystery (or two) Shades of Grey is a promising start to a new series. Please join me in welcoming author Clea Simon to Musings of a Bookish Kitty. Whatever happened to the good read? I mean, the kind of book you lose yourself in, that invites you to sink in and draw up the covers? I love plot, don’t get me wrong. And in my Theda Krakow mysteries, I worked hard to get the pacing fast, fast, fast. But when I wanted to try something new, I thought about those big, old books that I used to love. I thought about character and setting. I thought about tucking myself in with a book on a stormy night and reading till the wee hours. I thought up Dulcie Schwartz. Dulcie Schwartz, I should explain, is the heroine of my new mystery, Shades of Grey. Unlike most of today’s critics (or academics), she adores the original Gothics, the mood-rich otherworldly adventures of the late 18th Century, books like The Monk, The Castle of Otranto, and The Ravages of Umbria. (Okay, that last one doesn’t really exist, except in Shades of Grey, but don’t tell aspiring PhD candidate Dulcie that. She’s betting her academic career on this tale of ghosts, beleaguered heroines, and a forbidding windswept castle.) She likes a book you can sink your teeth into. And if those original Gothics went a little wild – piling on an unlikely number of specters and plots – well, so much the better. Not many people read these books today. Critics and theorists point out that authors like Anne Radcliffe and Horace Walpole were very much products of their times. All the turmoil in France and America was putting a good scare into British readers, and the social unrest revealed itself in some nasty anti-Catholic and anti-Continental biases (mad monks, duplicitous dukes, you name it). Plus, these books were so popular that they spawned a lot of second-rate spinoffs, potboilers that played up the sexual dangers besetting innocent young heroines without giving a thought to why the insane nobleman would want to imprison his young ward or who the ghost thought he was bewitching. Certainly, one reason these books have fallen out of favor is that their writing is leisurely. Wordy. Descriptions go on for pages, and characters talk and talk and talk. (In all fairness, even though Dulcie loves these books, I don’t go quite so far with Shades of Grey.) But I’ve found that once you get into the rhythm of a book like this, you don’t want to cut to the chase. You want to enjoy the mood and the atmosphere. You want to spend more time with the characters, real people with interesting lives whom we come to know and to care about. Isn’t that why most of us first fell in love with books? Didn’t we all, at some point, open the covers and find ourselves in another world – a world we hated to leave? Don’t we want that transformative experience again? I read my share of thrillers – they are good distraction when life gets crazy. But if we always know that the body will be found by page 10, the love interest identified by page 25, and the chase scenes begin by page 50, where’s the surprise? The magic? The enchantment? But where are these books today? They’re relegated to younger readers (think Harry Potter) or the scrap heap. They’re “wordy,” “slow,” or just not reviewed at all. It’s old hat to blame TV or our accelerated lifestyle, and I don’t think Twitter or Facebook are responsible either. I think we’ve forgotten how to enjoy ourselves. How to let pleasure build up. How to let a book envelope us completely, before giving us the payoff of action or resolution. I don’t know if I’ve achieved that with Shades of Grey, whether my new series (yup, the second, Grey Matters, is already in the works for early spring) will weave the same kind of spell. But I hope it does, because I believe that a book should surprise and delight with unexpected twists and turns. Should lure you in and keep you engaged, introducing you to characters who have real lives that don’t only involve solving crime. Books that are big enough to provide a portable vacation, whenever you can get away. 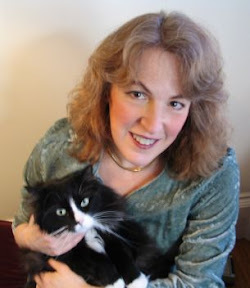 Clea Simon is the author of three nonfiction books: Mad House, Fatherless Women, The Feline Mystique; and the Theda Krakow mystery series (Mew is for Murder, Cattery Row, Cries and Whiskers, and Probable Claws). Shades of Grey is the first book in a new series featuring Dulcie Schwartz. You can learn more about Clea Simon and her books on the author's website and on her blog, Cats & Crime & Rock & Roll. Be sure and stop by Musings of a Bookish Kitty tomorrow for my review of Shades of Grey! Lovely post Clea! I thoroughly enjoyed it, especially that I agree 100%. 'Chunksters' happen to be my favorite kinds of books and sometimes I am sad to read how other people can't be bothered with long descriptive passages and how plot is so much more important. I think what partly is to blame is the need to rush everywhere and everything. And it is seeping from everyday life into the life of reading. More and more often it's not about the quality of books but the quantity. I LOVED this post! I so totally agree with the author regarding the NYT: what is wrong with a book being being "wordy"?? Isn't that the very definition of literature --- words on a page? I marvel at an author who can eloquently paint setting and characters with vivid word images. I am totally sold on reading this new book before the second in the series is published in the spring. Thank you so much for featuring this author and bringing her word to my attention! For me, life is very busy right now and as a stay-home mom with little kid, it's really hard to find quiet time to really sink into a book and savor the lavish words and long descriptions. I think that's why I have a hard time reading classics, when I used to love them. I am usually just too tired to focus that much, or have other worries that crowd into my mind, or only a short amount of free time to read in, so I wouldn't even make it through more than a handful of pages. It makes me sad, sometimes. I am hopeful that when kiddo is old enough to be in school, or at least not need constant attention, there will be more leisure time to savor the books in. In the meantime, it's something I miss. Thanks for responding folks! I do love a book that lasts and lasts - who wants the illusion, that world, to go away? And, yes, Jeanne, I understand about life getting in the way. I'm dealing with my mom's decline (she's got some dementia, am trying to get her out of rehab and back to her assisted living place), so I completely understand - but when I can escape into a book, I can. I'll meet you all between the pages ... whenever you can make it! Really enjoyed the post, Clea! I've been shying away from chunksters because I feel like I just don't have time for them. And, that's such a cop out but I guess I'd love to have plenty of time to spend with a big book. But really, when do we ever have enough time right? Anyway, having said that, I am currently reading The Woman in White and it's just fantastic getting caught up in the story. Very slow going but I don't mind it at all. The key thing to remember, Iliana, is that you're not on deadline. Take your time! The book will still be there - and a nice, big chunkster will be there longer for you! Great guest post, Clea - it's always nice when you come to visit Wendy :-). I love the idea of books that go on for awhile, and that you can immerse yourself in. But at the same time, I need them to move along with the story, because I just don't have enough time! It's a quandary. I'm definitely intrigued by Shades of Grey and hope I'll have the chance to get lost in it one of these days (or maybe several of them :-)). oh I want to be HOOKED right away - but I want lots of characters and things going on so I can stay in for a while, even if I can only manage a few pages before going to sleep at night! Am just finishing up a Phillippa Gregory ("The Other Queen") that's like that. I love to sink myself into a long leisurely novel. Some of my favorite novels are ones that others have labeled as "wordy" whereas I find them full of atmosphere and character. These are the books that sweep me off my feet and often stay with me in between readings. Thank you everyone for stopping in and thank you, Clea, for your wonderful post! What a great post! I loved reading this. Fantastic! I love huge books (in fact I'm currently working my way through one of 914 pages). As much as I enjoy something fast-paced, it's nice to know you can look forward to several weeks of settling down each evening to spend quality time with the one book. I've got a big Radcliffe in my library pile, too, so I'll be looking out for those biases. And I'm going to add Shades of Grey to my wishlist - Dulcie sounds like my kind of girl! and yes, my husband has been known to bring home books to me on the basis of their size. As in, "This should hold you for a while!" I often imagine that he sees me as a hungry beast to whom he throws large chunks of ... book! Wonderful post! I love what you said about books providing a "portable vacation" - so true. To me, there's nothing better than getting lost in a really big and wordy book to the point where you you just don't want it to end. And even better than that, a series that keeps on coming with new books to keep the story and the characters you've fallen in love with going. I can't wait for Grey Matters. I usually do not put much stock into professional reviewers thoughts...so I would've read the book too if it interested me!! Shades of Grey is one that grabbed my attention. I'll be looking for this one! I’ve found that once you get into the rhythm of a book like this, you don’t want to cut to the chase. You want to enjoy the mood and the atmosphere. You want to spend more time with the characters, real people with interesting lives whom we come to know and to care about. It's so true. I felt like it took me an eternity to finish THE WOMAN IN WHITE, (which I read earlier this month), but I enjoyed the characters and their story so much that I was almost sorry to see it end. I still miss them. Oh my goodness, what a pleasant surprise! I'm currently reading Mew is for Murder, which I found on Amazon after a search for mysteries involving cats. I'm only about a quarter of the way through, but I've already recommended it to a few friends. I live in Boston and I have a soft spot for local authors. Looking forward to reading the whole Theda Krakow series and Simon's new book. Thanks for this! Cass - I am glad you are enjoying Mew is for Murder. The Theda Krakow series is a fun one and I hope you will enjoy all the books in the series if you decide to read on. I definitely recommend Clea Simon's latest, Shades of Grey.